Two Ivans and Oksana by Voila Pushkarova, a painting from the Jurii Maniichuk and Rose Brady Collection, is part of the Brooklyn Museums’ installation, Russian Modern, in the European painting galleries. It has been on long-term view since September 28, 2011. The installation of thirteen rarely seen paintings from the collection of the Brooklyn Museum and the Maniichuk- Brady collection explores the impact and influence of Russian and former Soviet artists on modern European painting. Ukrainian artist Pushkarova painted her work (oil on canvas, 165.4 x 109.2 cm.) in 1964, shortly after graduating from the state-run Kharkiv Art Institute in Ukraine. She died in 2010 in Ukraine. 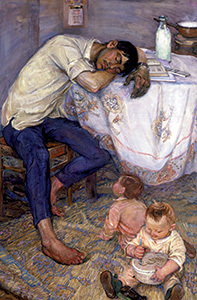 Maniichuk acquired the painting from the artist in the 1990s, while assembling his collection of close to 150 paintings of Ukrainian realist and socialist realist art. Russian Modern also features masterworks by such pioneering artists as Ilya Bolotowsky, Boris Anisfeld, Boris Gigoriev, Wassily Kandinsky, Vasily Vereshchagin, and Aleksandr Yakovlev. For more information, see www.brooklynmuseum.org. For an article in Russian about the installation, go to http://reporterru.com/?p=14353.